It’s no secret that travel gets more expensive in the summertime. Nothing says livin’ is easy like pouring all of your disposable income into a plane ticket. But before you begin selling your valuables on Craigslist to cover the difference, get this: there are loads of destinations to which flights are expected to be especially cheap this August. 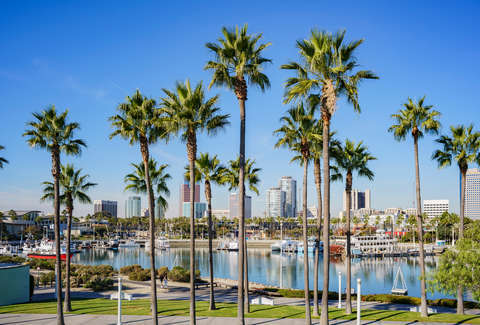 And one that’s looking especially especially cheap is Long Beach, California. According to the travel prophets over at Hopper -- the app that tracks all those mysterious fluctuations in airfare so you don’t have to -- flights to Long Beach will drop by 49% this month. This means you can get to sunny southern California for something like $185, the same amount of money you might spend on a pile of alluring-but-entirely-futile things at Target. Hopper’s predictions are 95% accurate, so rather than continue to wade through another A/C-less summer in NYC (a condition for which your tolerance may have also dropped 49%), consider the sandy shores of Long Beach. You can float around the canals of Naples Island in a rented gondola. Hit Huntington Beach and see some seals. Or, take advantage of the fact that you’ve got the entirety of Los Angeles at your fingertips, just an hours’ drive away. As an LA-based friend put it when I asked what the kids were doing in Long Beach these days, “nobody flies into Newark to go to Newark.” Which, ouch, but not wholly untrue. But before you skip up to LA, consider hanging around for a day or two. The city runs a dope free summer concert series, which takes place on various beaches four nights a week all the way until August 30. Long Beach is also in the midst of a serious restaurant boom, so this is your ticket (sorry) to the kuay tiew at Phnom Penh Noodle Shack or the Navajo tacos at Panxa Cocina. And because it is summer, so of course you are thirsty, don’t forget about the bar scene. Belmont Brewing Company -- the oldest brewpub in Southern California -- is your quick-pick destination for drinks with ocean views. If you’re looking to get ruined on $4 well drinks over the course of a very long night (who isn’t? ), you’ll want the Fourth Street dive bar crawl: V Room, Red Room, Fern’s and Ashley’s. And finally, we cannot in good conscience tell you of the best bars in Long Beach without urging you to go to national treasure Hamburger Mary’s, the city’s largest gay bar, which no matter who you are or whom you love, is where you go to find all that is right with America.